Both components of this post are a little unusual for me. I don't usually do movie reviews (I don't see very many movies!) and most of the recipes I post are recipes that reflect my taste preferences. First up, a movie. I noted back in August that my book club group read The Help, which focuses on racial tensions in 1960s Mississppi, through the writing of a (fictional) book containing stories from the black 'help' who are employed, and controlled, by white families. Last night, 5 of our group went to see the movie version. I was looking forward to seeing it, but didn't have very high expectations as I had read rather mixed reviews. The main criticisms seemed to be that it was too long, at well over 2 hours (not something I usually enjoy in a film), and that the ideas underpinning the book and film weren't explored as well as they could have been. As it turns out, I really liked this movie. I thought the actors did a wonderful job, particularly Bryce Dallas Howard as the unlikable but well played Hilly Holbrook, Viola Davis as the central Aibileen, and Octavia Spencer as sassy Minny. The movie didn't follow the book precisely, but I found the variations from the text to be understandable, and sensible for a film adaptation. It didn't provide any answers, but I thought it addressed the central issues and race conflicts with poise and consideration, and also humour. The 1960s outfits were pretty impressive, too. Who knew I liked that time period so much for fashion? Amazingly, I also got through the movie without being bored. Given my usually short attention span for TV or movies, and the running time of nearly 2.5 hours, this was quite impressive. All in all, it was a film I would recommend - although, as always, I would recommend reading the book first. As the title of this post suggests, I also have a mud cake muffin recipe today. You see, Mr Bite doesn't always share my preferences for vegan, raw, and/or vegetable-based baking. He often likes the end product, but it probably wouldn't be his first preference. These muffins were for him. 1. Preheat oven to 160'C and prepare a 12-pan muffin tray (or a 6-pan tray if you're making large muffins). 2. In a heat-proof bowl, combine the butter, chocolate, hot water, and milk. Heat over a medium saucepan on low heat, or in the microwave, until the ingredients have melted and the mixture is smooth. I used the microwave on 50% power and it took about 2 minutes, in 30 second bursts. 3. Remove the chocolate mixture from the heat and add the peppermint essence and brown sugar. Stir to combine and set aside to cool slightly. 4. In a separate bowl, whisk the egg and add the flours and cocoa powder. Add the melted chocolate mixture to this bowl and mix with a hand whisk until ingredients are combined. 5. Divide the mixture across the prepared muffin pans and bake for 15 - 20 minutes, until the muffins are cooked through. Transfer to a wire rack to cool completely. 6. When the muffins are cool, prepare the icing by combining the avocado, cocoa and icing sugar in a food processor or with an electric beater. Mix until smooth and the avocado is fully processed. I think next time I would add more peppermint essence, as Mr Bite didn't pick up on it as a distinct flavour. However, the muffins were definitely dense and chocolatey. They were also surprisingly easy, being made and baked within 45 minutes. Hopefully they've gone some way towards countering the tofu dinners, vegan experiments, and quinoa side dishes! 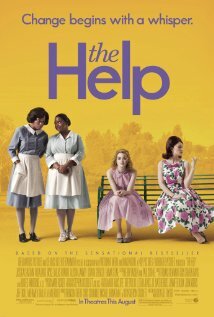 Have you seen The Help? What are your thoughts on film adaptations of books? Most of the time when I read a book, I choose not to see the movie. They so rarely give you all the emotion and detail that you get from the book. I also like being able to imagine the characters in my mind when reading... movies just give you the face. I haven't seen The Help.. but would love to! Aren't you wonderful :) Yes, I often end up baking not-vegan and most extravagantly-sweet creations for those I care about than I'd make for myself alone. And it's funny, I'd never even heard of The Help until the movie came out and there was a big hullaballoo about it! I have the book in my 'to read' pile so I can't watch the movie yet - I really want to read the book first :-S I'd better get reading! I havent seen the movie...actually, when was the last time I went to the movies?? I did watch The Slap last week though, and I loved the book a few years back, so was curious to see how they would portray the characters. That is a beautiful summary of the muffins! :) I hope you enjoy the movie if you do get to it. Well, I hadn't heard of it until we did it for book club, which wasn't much before. It's sad that the movie stole all the publicity though! Films always get the greater share of attention. I think one of the poignant things about the book / film are that they're about a time that is not *that* long ago. My Mum could have grown up in that town if she'd lived in America. It makes it much more real! Given how infrequently I go to the movies without having any children to factor in to plans, I have no idea how people manage it post-parenthood! I have missed The Slap, which was a bit foolish. I might come in late and try to catch up as it seems to have got quite a lot of attention. Looks a super movie - and as for these chocolate-mint muffins, they are so temptingly wicked. Wonderful! The Help is on my list to see with my Mum - if we are ever free at the same time. I have a serious feeling we will be watching it on DVD at this rate.